There is no dearth of free file sharing services. In fact, there are hundreds of cloud storage and file sharing services around. OneDrive, Google Drive, Dropbox, and iCloud Drive are the popular file storage and sharing services out there. Firefox Send is a new free file sharing service from Mozilla. Like most other file sharing services out there, you don’t need to install an app (in fact, there is no app) to begin sharing files. Besides that, you don’t need to create an account or sign in to Mozilla account to share or download a file under 1GB size. As of now, Firefox Send allows sharing files up to 1GB without signing in to the service. If you have a Mozilla/Firefox account or willing to create one, you can share files up to 2.5GB at a time. 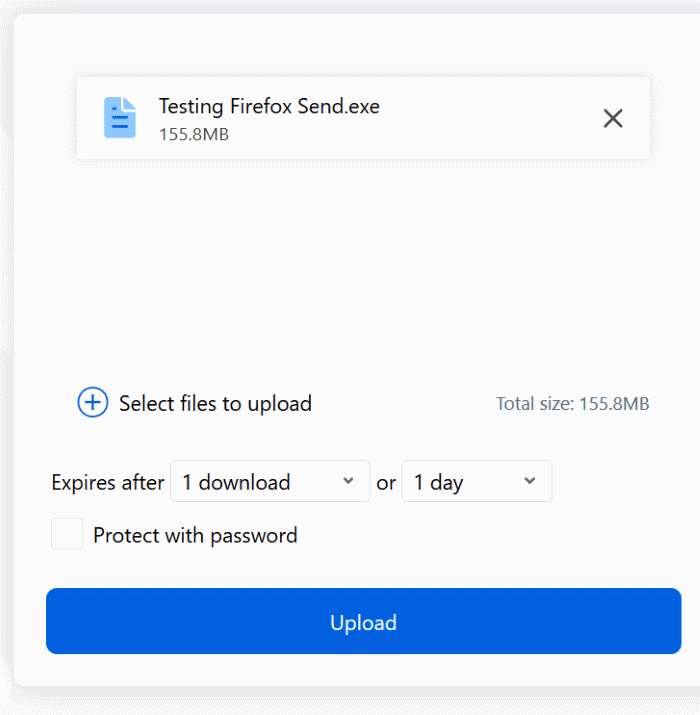 Unlike many file-sharing services out there, Firefox Send lets you share files with end-to-end encryption which means that you can keep your files private. The shared link can be configured to expire after x number of downloads or x number of days. A shared file can be downloaded for a maximum of 100 times or 7 days, whichever is earlier. Of course, you can configure the link to expire after 1, 2, 3, 4, 5, 20, 50, or 100 downloads. When you select a file to upload, you will be offered options to set the expiry and password (optional) for the file. The catch with the sign in free upload is that a file uploaded without signing will expire after one download or in a day. Likewise, if you want to keep the hosted file’s link active for more than one day (supports a maximum of 7 days), you will need to sign in to the free service. 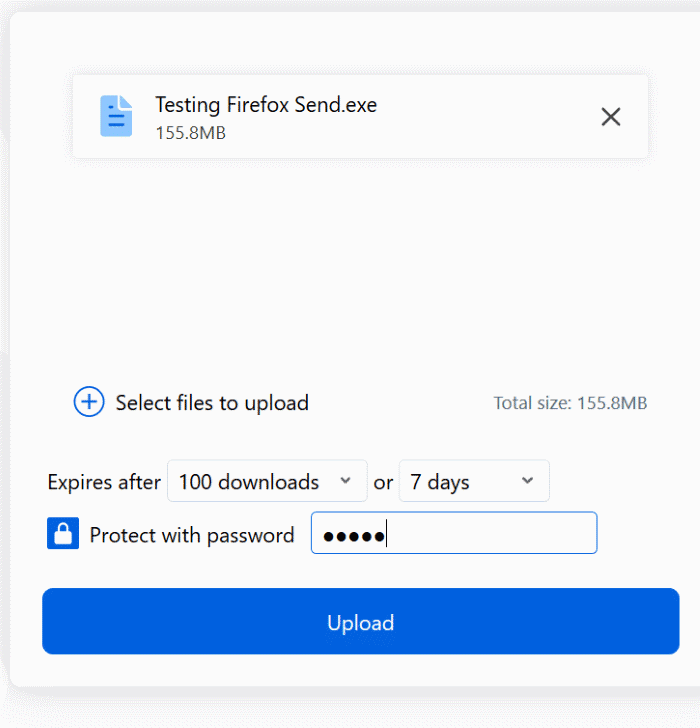 By signing in to the free Firefox Send, you can share files up to 2.5GB, share files with more people (up to 100 downloads), keep the file hosted for up to 7 days, and manage shared files from your account. Overall, Firefox Send is a fantastic service from Mozilla. Given the fact that it allows you encrypt and share files up to 2.5 GB, it’s the best free file sharing service from a trusted developer. Firefox Send is also pretty good in the privacy department. 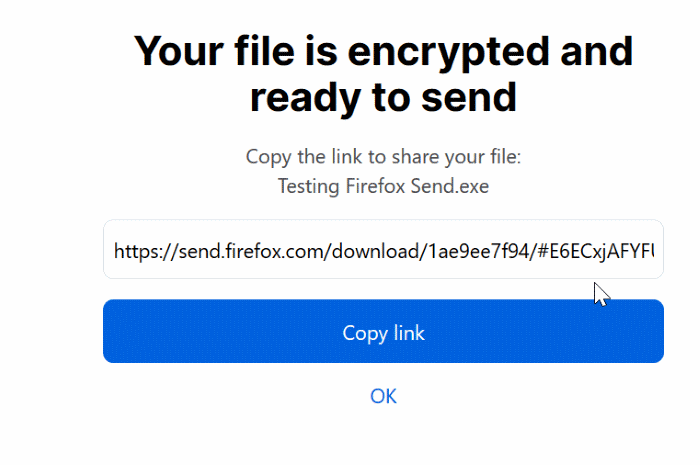 According to the privacy page on Firefox Send, Mozilla receives an encrypted copy of the file that you upload, and it cannot access the file content or name of the file. Files are stored on Mozilla servers for a maximum of 1 day or 7 days, depending on how long you would like to store/share an uploaded file. If you are wondering, no, you don’t need to have installed Mozilla Firefox to upload or download files to and from Firefox Send service. Once a file is uploaded, you will get a link which you can share with anyone to let them download the file. The link will automatically expire once it reaches specified time or download limit. If you have set a password while uploading a file to Firefox Send, you will have to enter the password to download it. In fact, one cannot see the name of the file without entering the password. It’s worth noting that your browser’s memory usage might go up by at least the size of the file that you are uploading. That is, when you are uploading a file of 2GB, you can expect your web browser to use around 2GB of memory. The reason is, Firefox Send encrypts and decrypts files in the browser. Visit the following link to begin sharing files with Firefox Send.